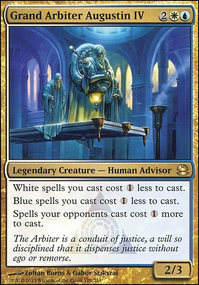 A little control goes a long way, I'd maybe recommend putting in one or two of the following humans: Grand Abolisher , Magus of the Disk , Magus of the Moat , Palace Jailer , Peacekeeper . Also I think 34 lands in a little low, how does the deck perform currently? Are you missing land drops? 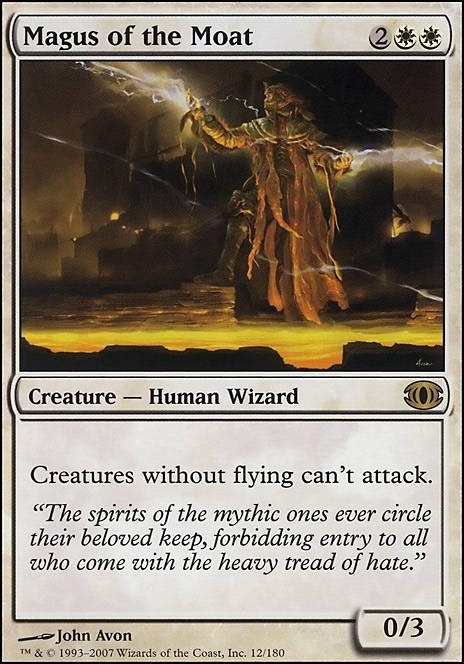 if the thing you want is to have a deck focused on flying creatures or spells without good or bad additions, why not make a commander deck? if you already got the colors figured out you could use Raff Capashen, Ship's Mage, Azor, the Lawbringer or even Medomai the Ageless. with that combination you got a lot of ways to control the board and protection for your creatures, and add 40 more cards to the deck. Aboshan's Desire, Flood, Tidal Flats, Spirit Bonds, Invocation of Saint Traft, Angelic Favor, Entreat the Angels, Tidal Surge, Decree of Justice, Battle Screech, March of Souls, Descend upon the Sinful, Storm Herd are cards that you could use in commander but not in this deck... if you want to have a reliable way to trigger Sigil of the Empty Throne you can use Flickering Ward, Shimmering Wings, Conviction, Brilliant Halo, Gossamer Chains, Viscerid Armor, Ephara's Enlightenment and others. 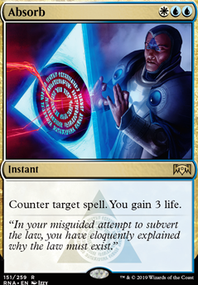 Aven Mindcensor, Mana Short, Boomerang, Standstill, Magus of the Moat, Bident of Thassa, Sigil of the New Dawn, Hindering Light, Supreme Verdict. DemonDragonJ on Guess the Green Magus! In the Time Spiral block, three cycles of magi were printed: one cycle inspired by iconic lands (i.e., Magus of the Tabernacle), one cycle inspired by famous enchantments (i.e., Magus of the Moat), and one cycle inspired by famous artifacts (i.e., Magus of the Disk). In the past several Commander sets, there have been magi inspired by iconic instants and sorceries: Magus of the Will, Magus of the Wheel, Magus of the Mind, and, most recently, Magus of the Balance. That leaves only a green magus left, so I now wish to speculate on what that magus shall be, and, more specifically, after what green instant or sorcery it shall be modeled. 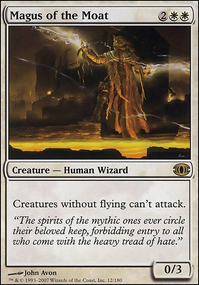 As with the first four, such a magus will likely be modeled after a card that is on the reserved list or otherwise has not been reprinted in a long time, and also one that is both iconic and powerful; therefore, both Desert Twister and Tooth and Nail, for example, are not likely candidates. What does everyone else say about this? What green instant or sorcery shall be used as the model for the final magus of this cycle? I eagerly await your responses. 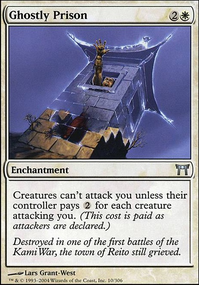 I have something to apologize about as well; Gatherer showed nothing of such a sort for Planeswalker Protection. This is going to REALLY sound damn sketchy, but maybe I should be using Pillowfort after All? I can think of a stupid 3 Point combo w/ some kind of use: Eldrazi Monument + Sandwurm Convergence + Moat/Magus of the Moat = Only you can Attack.